Poison Spyder's SpyderShell™ finish is more than just powder coating—it's a complete system that includes the state of the art in preparation, application, materials and packaging to ensure that your SpyderShell™ products stay looking great for years. 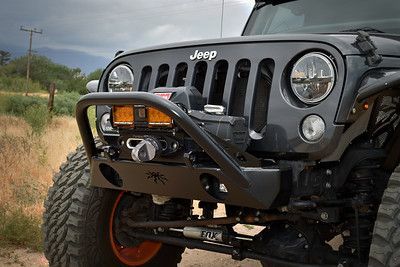 The SpyderShell™ process has been engineered to provide your Poison Spyder product with years of unmatched great looks, corrosion protection and weather-resistance. Our proprietary 6-stage system starts with media blasting the entire part, to remove contaminents and prep the metal surface for the best possible adhesion. Next, any seams are sealed with 3M Scotch-Weld to block moisture from entering and causing corrosion where the powder can not reach. The first coat to be applied is a zinc-rich powdered black primer, which is baked on to form an impenetrable bond between the metal product and the coating. The primer is black--rather than traditional gray--so that any rock chips or trail damage are less conspicuous. The final top coat is an industrial grade, "super-durable" architectural finish in semi-gloss black, which is engineered to retain its appearance through years of exposure to sun and weather. SpyderShell is a coating process unmatched by any other Jeep armor aftermarket manufacturer, for which we are confident in offering a 5-year warranty on materials and workmanship.